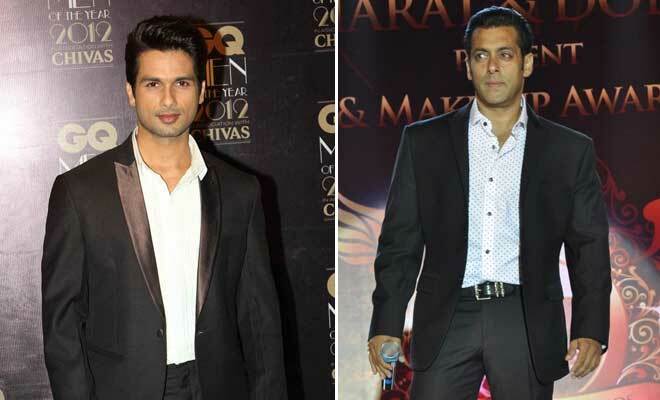 Years ago Salman Khan was apparently miffed with Shahid Kapoor, due to the latter trying to advise the temperamental Khan over some dance steps during some shows abroad. Khan, who takes his time when it comes to forgiving and forgetting, seems to have cut Shahid some slack by agreeing to a cameo in Shahid's upcoming comedy – Phata Poster Nikhla Hero. And Shahid too has done his bit to appease the Khan and stroke his ego. In the film his character plays a huge Salman fan – now if that doesn't score brownie points with Salman then nothing will! "There's a little scene in the film where Salman sir is there... Salman sir was kind enough to do a special appearance in the film," said Shahid at a press meet for the film. Talking about his character's fascination with Salman, Shahid said: "He (Shahid's character) is a very big fan of Salman Khan and in one scene we have even worn a 'Being Human' t-shirt and in another scene, the character has gone to buy vegetables with his mother and his hands are full and he is eating a banana standing and watching the poster of Dabangg 2." Well we hope this mutual admiration society stands the test of time. Shahid should consider himself lucky. Just ask Vivek Oberoi, John Abraham and co – they've all been trying to get into the mercurial's star's good books for ages, and failing miserably. Phata Poster Nikhla Hero is directed by Rajkumar Santoshi and see Ileana D'Cruz opposite Shahid. It hits the marquee 23 August. Salman-Ileana confirmed for Sooraj Barjatya's next?